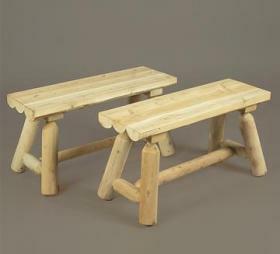 Sturdy yet lightweight, these generously sized 36” log-style benches are paired here with our large square table but are very portable and can go wherever they’re needed. Solid cedar construction ensures years of carefree use. Cedar is also naturally resistant to decay, insect, and weather damage and, when left untreated, the creamy natural color weathers gracefully to a silvery grey.